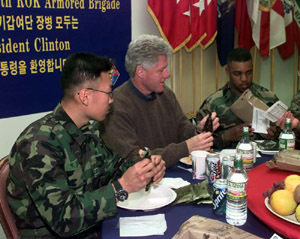 President Clinton has a "Meals-Ready-To-Eat" lunch with troops at the Mess Tent at the Korean Training Center. Photo by Ralph Alswang. 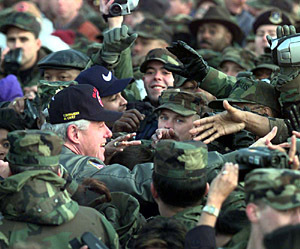 After lunch, the President greets soldiers at the Korean Training Center. Photo by Ralph Alswang. 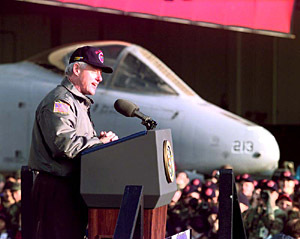 President Clinton makes remarks to Osan Air Force Base personnel and families. Photo by Ralph Alswang. 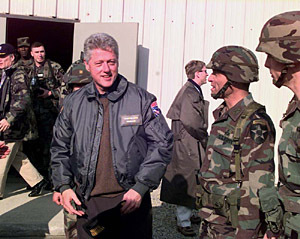 After making remarks to personnel and families, the President moves through a crowd of soldiers at Osan Air Force Base. Photo by Ralph Alswang.